↑ "American FactFinder". United States Census Bureau. สืบค้นเมื่อ 2012-06-24. ↑ 3.0 3.1 "Population and Housing Unit Estimates". สืบค้นเมื่อ June 9, 2017. ↑ US Census Bureau. "American FactFinder". สืบค้นเมื่อ 2011-04-13. ↑ Reuters, Monowi, Nebraska, Population: 1. ↑ "Home | Daily Mail Online". Mail Online. สืบค้นเมื่อ 2018-03-01. ↑ Bright, William (2004). Native American Placenames of the United States. University of Oklahoma Press. p. 296. ISBN 978-0-8061-3598-4. ↑ Chicago and North Western Railway Company (1908). A History of the Origin of the Place Names Connected with the Chicago & North Western and Chicago, St. Paul, Minneapolis & Omaha Railways. p. 104. ↑ Fitzpatrick, Lillian L. (1960). 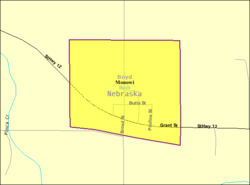 Nebraska Place-Names. University of Nebraska Press. p. 22. ↑ United States Census Bureau. "Census of Population and Housing". สืบค้นเมื่อ June 23, 2013. ↑ "Annual Estimates of the Resident Population: April 1, 2010 to July 1, 2012". Archived from the original on November 20, 2013. สืบค้นเมื่อ June 23, 2013. หน้านี้แก้ไขล่าสุดเมื่อวันที่ 3 กันยายน 2561 เวลา 18:10 น.